And sometimes clients checking for Windows Updates would quickly error out with a code 0x80244021 which indicates the inability to reach WSUS. To improve WSUS availability, you need to increase IIS Private Memory Limit. The default limit is set to 1843200KB. And when an IIS worker process uses more than 2GB WSUS crashes and the problem occurs. 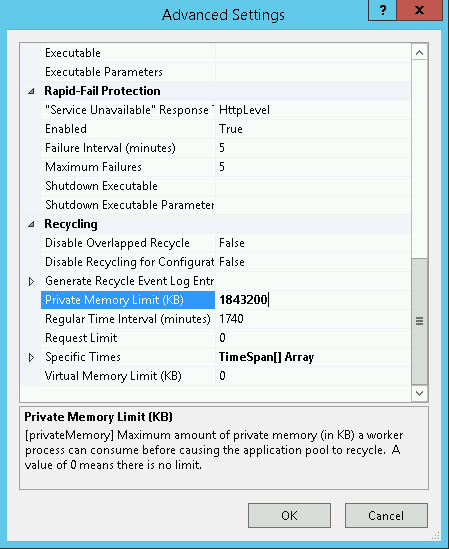 Internet Information Services (IIS) Manager → Server → Application Pools → Select “WSUSPool” → Actions Advanced → Recycling → change “Private Memory Limit (KB)“.